A private equity firm has purchased the rights to environmental services generated by a 371,000-hectare rainforest reserve in Guyana. Terms of the deal were not disclosed, but the agreement is precedent-setting in that a financial firm is betting that the services generated by a living rainforest — including rainfall generation, climate regulation, biodiversity maintenance and water storage — will eventually see compensation in international markets. In exchange for funding a "significant" part of the costs of maintaining Iwokrama rainforest reserve in Guyana, the agreement grants UK-based Canopy Capital the right to 16 percent profit from proceeds generated from environmental services payments. 80 percent of the income generated would go to local communities while the Global Canopy Programme, an alliance of 29 scientific institutions in 19 countries, would receive four percent. While the environmental services market is presently limited to voluntary markets, investor interest is growing. Last December, Merrill Lynch invested $9 million in rainforest conservation in Sumatra, expecting to eventually profit from the sales of carbon credits. Meanwhile in November, New Forests, a Sydney-based investment outfit, established a wildlife conservation banking scheme in Malaysia. The firm expects annual returns for selling "biodiversity credits" to developers to be in the 15-25 percent range. Canopy Capital hopes to do the same, while at the same time developing a market for the utility value of living rainforests. "How can it be that Google's services are worth billions, but those from all the world's rainforests amount to nothing?" asked Hylton Murray-Philipson [Interview with Murray-Philipson], director of Canopy Capital. "As atmospheric levels of carbon dioxide rise, emissions will carry an ever mounting cost and conservation will acquire real value. The investment community is beginning to wake up to this." Canopy Capital's decision to fund rainforest conservation in Guyana in an interesting one: Guyana's low deforestation rate handicaps it in a market (Reducing Emissions from Deforestation and Forest Degradation -- REDD) that seems likely to reward high deforestation countries for reducing their rates of forest clearing. Still Guyana's president Bharrat Jagdeo has shown interest in environmental services — last fall he offered up the country's remaining forests as a giant carbon offset. "We can deploy the forest against global warming and... it wouldn't have to stymie development in Guyana," President Jagdeo told The Independent last November. "We are a country with the political will and a large tract of standing forest. I'm not a mercenary, this is not blackmail and I realize there's no such thing as a free lunch. I'm not just doing this just because I'm a good man and want to save the world, I need the assistance." At the time President Jagdeo cited Iwokrama, a "sustainable-use" reserve that supports 7,000 people and locks up around 120 million tons of carbon, as a potential model for such payments. "Forests do much more for us than just store carbon. We should move beyond emissions-based trading to measure and place a value on all the services they provide. This initiative fits perfectly with Iwokrama's original mandate to demonstrate that conservation, environmental balance and sustainable economic activity can be mutually reinforcing," said Iwokrama's Chairman Edward Glover. "Moreover, this first significant step is in keeping with President Jagdeo's visionary approach to safeguarding all the forests of Guyana. It also ensures, with the Commonwealth's support for Iwokrama, that the world hears a knowledgeable and persuasive voice on a matter of growing international concern." 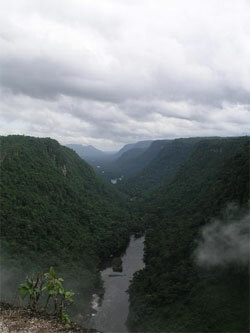 The new deal offers hope to conservationists that Guyana's forests can be economically viable as intact ecosystems. Climbing prices for gold and timber, coupled with surging demand for biofuels derived from sugar cane, have raised concerns that developers may push for infrastructure improvements that could transform Guyana's forests. "Saving rainforests can only occur through attracting significant capital flows, and the private sector is beginning to play a leading role alongside government and philanthropy," said Abyd Karmali, Managing Director and Global Head of Carbon Emissions at Merrill Lynch. "This deal presents a template for monetizing the benefits that come with the protection of standing forests. The preservation of ecosystem services in countries that choose to conserve their forests could become a billion dollar market." While most investors are currently eyeing forests solely for their carbon value, Murray-Philipson believes they are overlooking more important services — especially rainfall generation. "If I were a farmer in Brazil's Mato Grosso or the mayor in Atlanta I would be very concerned about deforestation in the Amazon," he told mongabay.com, referring to studies by Duke University's Roni Avissar that have linked forest clearing in the Amazon to rainfall in North and South America. "The market is looking at carbon but what I believe will be far bigger will be the maintenance of rainfall." Murray-Philipson says that since there's no market for the services provided by rainforests, his firm sees the present as a good opportunity for investment. "The market for these ecosystem services doesn't exist — therefore it can't go any lower," he said. "We see this as an opportunity to drive capital to the canopy." Murray-Philipson believes that an "equitable and just" system based on the insurance market will eventually emerge as a vehicle for paying for environmental services provided by living ecosystems like rainforests. "All my life I've been reading about rainforests going up in smoke and indigenous people disappearing. The most important thing that's been missing in the equation has been money. 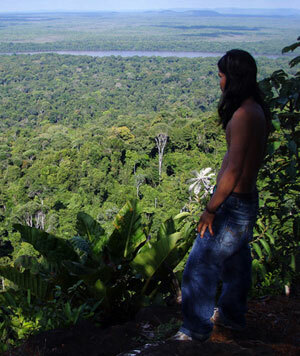 Now we have a real chance to engage and save rainforests." "The Stern report estimated that it's going to take $15 billion per year to pay for the maintenance of tropical forests," he said. "While that number seems quite intimidating, it is actually incredibly doable. The other way of looking at it is the cost of not doing something is going to be significantly greater than whatever the cost of starting that trend of payments today." 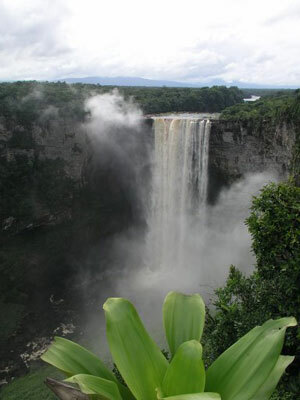 (04/02/2008) Last week London-based Canopy Capital, a private equity firm, announced a historic deal to preserve the rainforest of Iwokrama, a 371,000-hectare reserve in the South American country of Guyana. In exchange for funding a "significant" part of Iwokrama's $1.2 million research and conservation program on an ongoing basis, Canopy Capital secured the right to develop value for environmental services provided by the reserve. Hylton Murray-Philipson, director of Canopy Capital, says the agreement — which returns 80 percent of the proceeds to the people of Guyana — could set the stage for an era where forest conservation is driven by the pursuit of profit rather than overt altruistic concerns.